Attributed mainly to the steadily rising demand for automotive vehicles in the country, Hyundai Asia Resources, Inc. (HARI), the official distributor of Hyundai vehicles in the Philippines, hit record sales ending the year 2016. Hyundai closed its Full Year 2016 sales with a 53 percent growth as compared to the previous year. 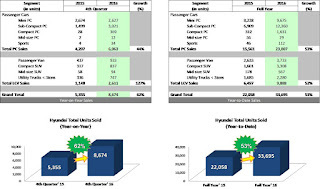 Vehicle sales reached 8,674 units in the 4th Quarter alone, equating to a 62 percent Year-on-Year increase. 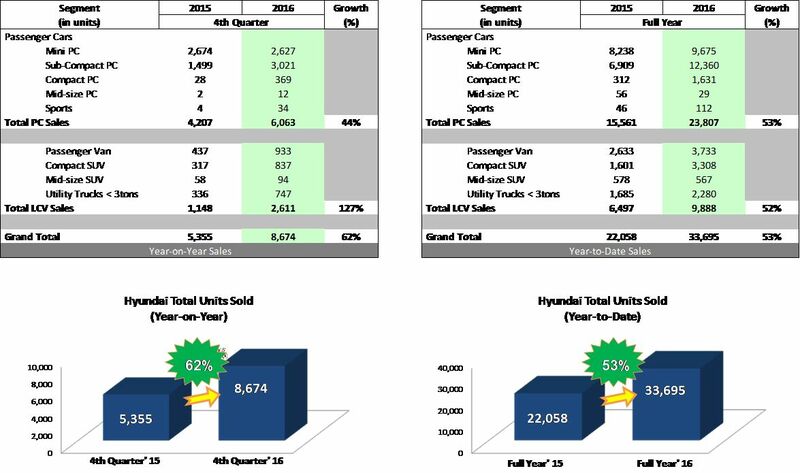 As the front runner of HARI’s growth, the PC segment grew at a double-digit rate of 53 percent for the full year. Led by the Eon and Accent, the two name plates remain as part of the top selling passenger cars in the country. The Light Commercial Vehicles (LCV) segment was not far from the spotlight as it pushed to grow 52 percent of the same period from the previous year, with the well-loved Grand Starex passenger van leading the company’s LCV sales. Amidst the proposal to increase taxes on both fuel and automotive vehicles, a strong macroeconomic foundation, higher disposable income, and an upbeat rating in auto-buying intentions, has kept an opportunistic view as the demand for automotive vehicles continue to show no signs of a slowdown.